It’s super easy to make at home, and you can customize it as you like. 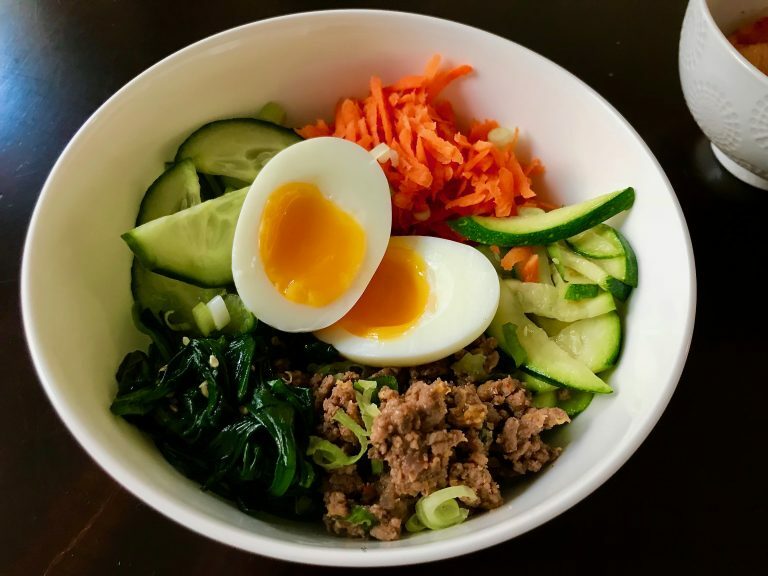 On hand, I had zucchini, carrots, spinach, and cucumber for my veggies, and some ground beef and eggs for the protein. My rice cooker was already occupied today (it doubles as a slow cooker and a bunch of other things that I haven’t tried yet like yogurt maker), so I made some quinoa on the stove for the base. 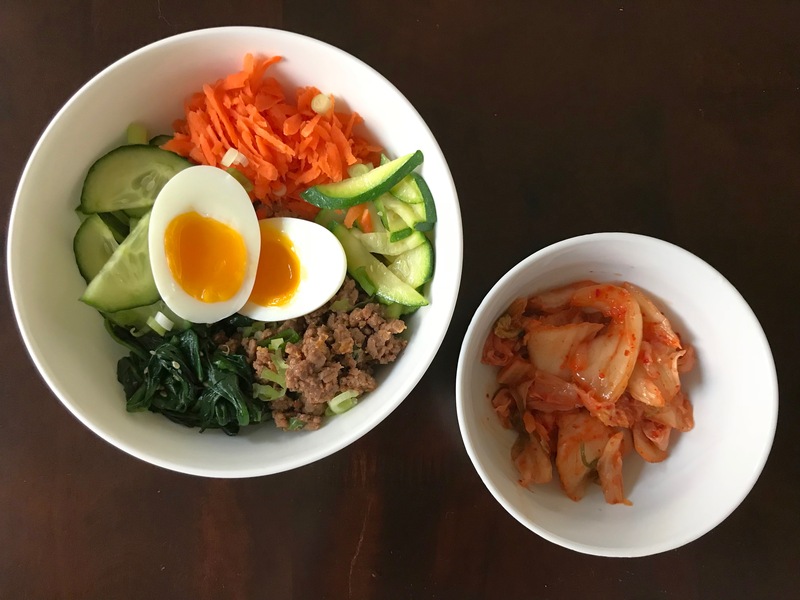 I like to add an egg – either soft-boiled or fried, as long as it’s a little bit runny – and have kimchi on the side. You might want to pre-mix everything in a separate bowl before you plate it, just to make sure the sauce is completely incorporated. And as I said before, you can change up the vegetables, the base, even the meat according to your own taste. So there you go – a healthy veggie-packed bowl that comes together quickly and leaves you completely satisfied. You can whip this up for a weeknight dinner, eat leftovers for breakfast, or even pack it to take to work for lunch. But if you do take it to work, DO NOT bring the kimchi. Your co-workers will not appreciate it if you do! Growing up with a Korean mother, I learned to shield the rest of your refrigerator from your kimchi jar by using two, if not three, ziplock backs to double bag the jar. Of course, in the winter, we would just keep the kimchi outside the house. I can’t exactly do that in New York City, so double-bagging in the fridge will have to do. If you don’t heed this warning – beware! I’ll never forget the kimchi incident of July 2012 when my family left a large jar of kimchi in the car overnight in the garage. It was almost as bad as the time when an unsecured container of gasoline leaked in the trunk of my car. In both cases, the cars were not fit for passengers. Heat 1 Tbs oil in a large sauté pan. Sauté the spinach until just wilted. Turn off the heat, and season to taste. Stir in the sesame oil, 1 tsp soy sauce and garlic powder. Remove the sesame to a small bowl. Sauté the zucchini slices, or whatever other vegetable you are using, until just tender and add a pinch of salt. Remove the zucchini to another bowl. Add a little bit more oil to the pan. Over medium high heat, brown the ground beef. Season with a pinch of salt. Once all the beef is brown, add 2 of the chopped green onions, the brown sugar, 1 Tbs soy sauce, and sriracha. Mix everything together, cook for about another 1-2 minutes, and turn off the heat. Assembly: add even portions of each cooked ingredient to your base. 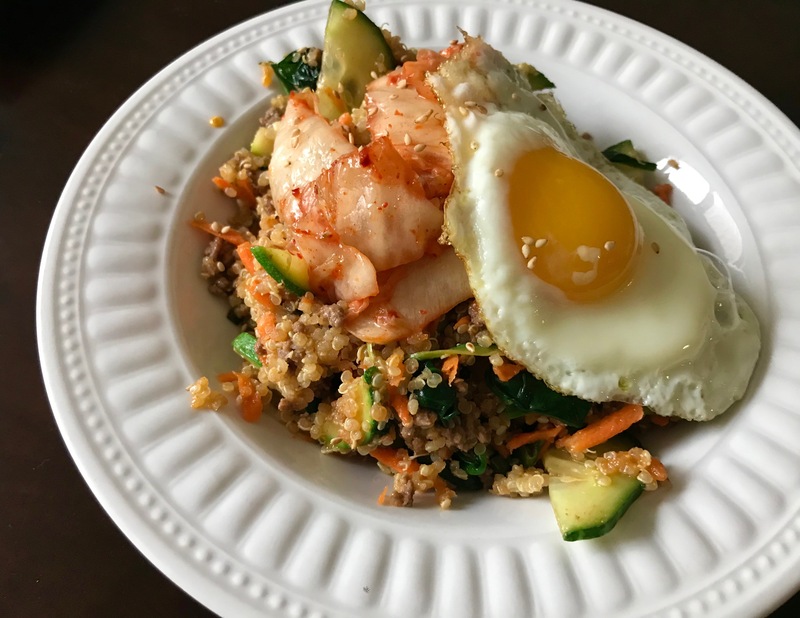 Top with egg and kimchi. Drizzle with sesame oil or sriracha if desired.